You are probably wondering why my title says 2 Tasty Yabu Adventures. It is quite accurate though! After arriving from a short weekender in Bacolod last March I met Mum and Zoe in Church at PICC then after church, we proceeded to MOA where I told Mum that I will take them to a nice katsu place. I’ve wanted to get mum and little Z there for a while now and see how they like the food at Yabu so I hurriedly went off to find the new Yabu branch in MOA. 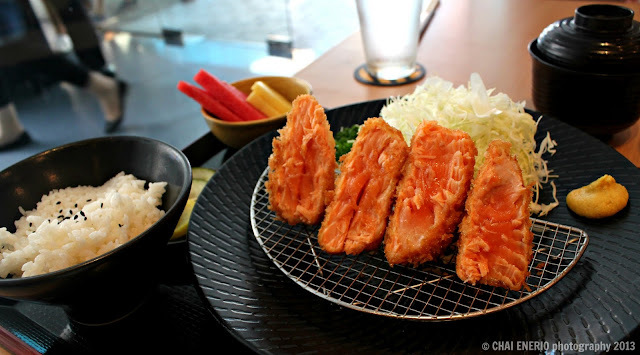 I did find it and since we were there as early as 10am, we had no problems finding a table and escaped the weekend lunch crowd which would have you waiting for 30-45 minutes to get seated at Yabu. They are that popular these days. 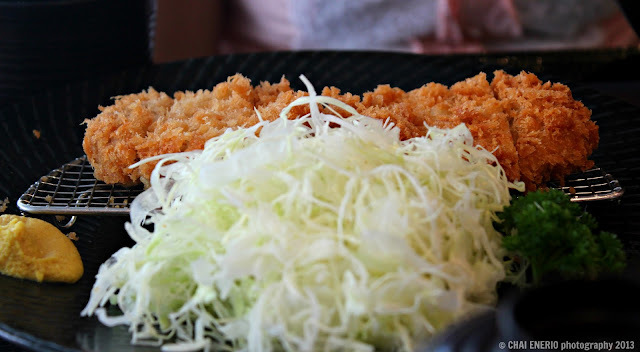 When we got seated at our table, we were given the menus and Mum chose the Hire Katsu Set while I got the Salmon Katsu and little Z surprisingly wanted her own and she chose the Kid’s Chicken Katsu Meal. 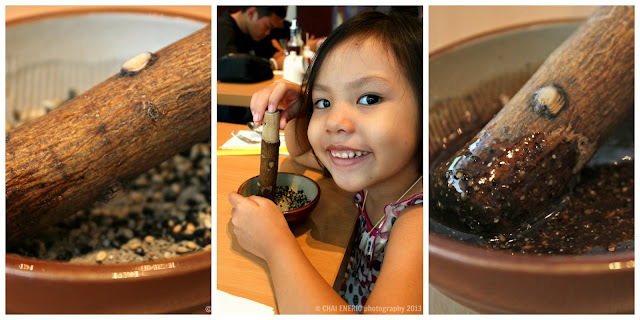 We were then given 2 big bowls of roasted black and white sesame seeds as is their ritual and I taught Mum how to grind the seeds together to release the aromatic and tasty oils for the katsu sauce. I gave mine to Z who was enjoying the whole experience. 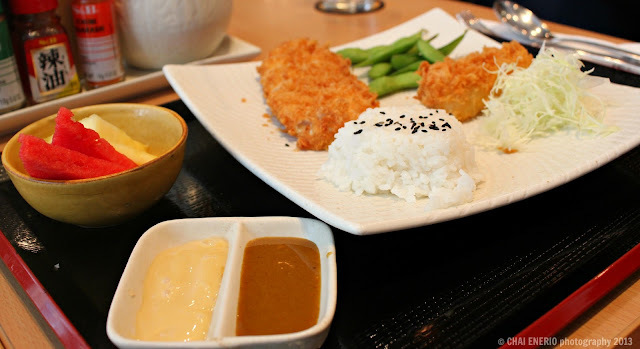 When her kid’s chicken katsu set meal came, I was intrigued and I knew that Z would love it. There were 2 breaded chicken katsu’s that came with it and a potato croquette served together with some edamame, Japanese rice, shredded cabbage and a bowl of fruit. She loved her crispy and juicy chicken and also the croquettes. She also tried the cabbage with the Goma dressing and loved it right away. When Mum took in her first forkful of her Hire Katsu she was amazed and commented that she rarely had pork that was very tender, juicy and cooked just right. She immediately became a fan of the shredded cabbage with the Goma dressing just as I once was when I first tried it out. She loved her Hire Katsu Meal and ate with gusto. 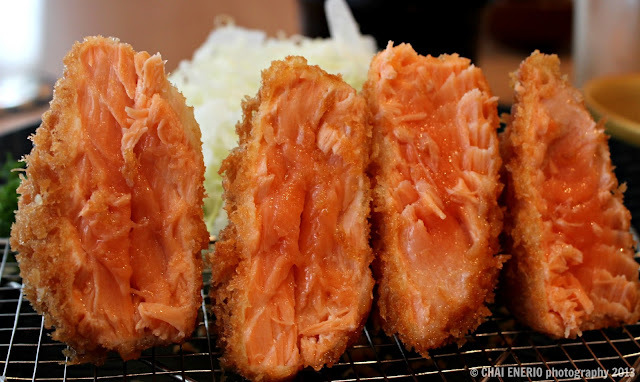 I ordered the Salmon Katsu and was presented with 4 lovely slices of panko-breaded salmon cooked just right with a glistening pink center. Juicy and not dry, the salmon was perfect as a welcome-home meal. One thing I appreciated at their SM MOA branch is that their branch manager came up to us and asked us how our meal was and if we were delighted with their food. I am impressed with the service so far. I tried the SM Megamall and now their MOA branch and always their service never fails. Now on to the 2nd part of this entry – a few days after we ate at SM MOA, I received an email from Yabu’s marketing staff – Erika Lim. She said that they had read my first entry on Megamall and wanted me to come and try out the new dishes that they were offering. Lucky me! We then agreed to meet at MOA and I also brought Mum and Zoe since she told me to bring along others if I wanted. Erika was very patient and informative and I love this kind of strategy that Yabu is adapting – taking a one-on-one approach to bloggers. She introduced me to their new dishes and some old ones I haven’t tried yet but also that they were introducing this new Wasabi dressing for the shredded cabbage they serve together with their katsu meals. I got intrigued and tried it first and it did not disappoint. It just had the right hint of kick from the wasabi but never overpowering. 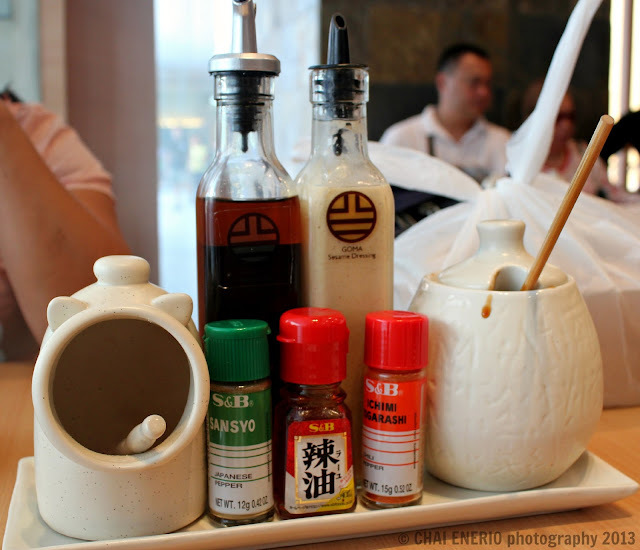 I loved it and just like with the Goma dressing I fell in foodie love. It was creamy but not super thick in the consistency. Similar to the consistency of the Goma dressing, I so love this new Wasabi dressing. It hits it right on the spot with the shredded cabbage! 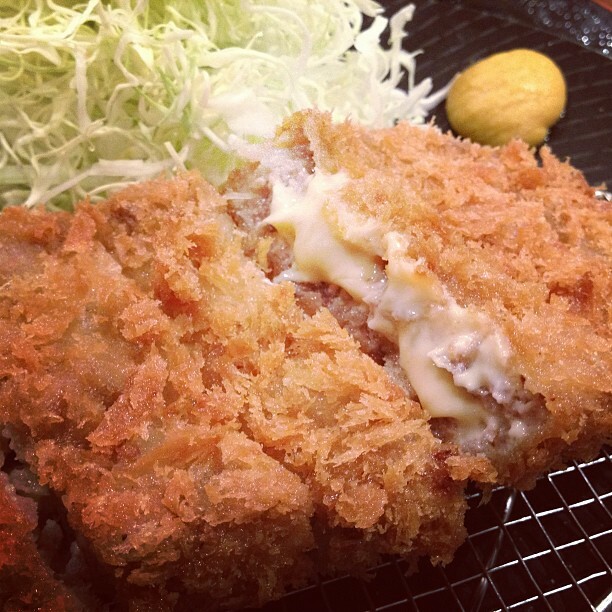 She ordered the Soft-shell crab katsu meal, the Menchi katsu meal and Menchi curry meal. 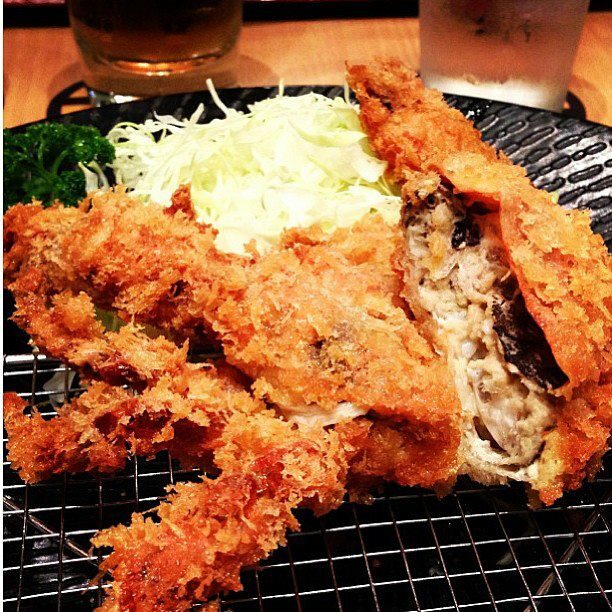 My particular favorite would be the soft-shell crab which was tasty soft crab in the inside but crispy panko goodness on the outside. A winner at the table and it went so well with the ponzu-layu sauce that accompanied it. In particular, the crab legs were so crunchy and so tasty that I finished them all first. The Mum had Menchi and she said that she liked it. It was even softer and easier to chew on than their already soft Hire or Rosu or Kurobuta pork. It is premium grade beef and pork minced together and some kind of cheese in the middle and this was an added plus. The Menchi is great for the cheese lovers. It would also be great with the kids. Something fried and cheesy always does the trick for the little ones, wouldn’t you say so? 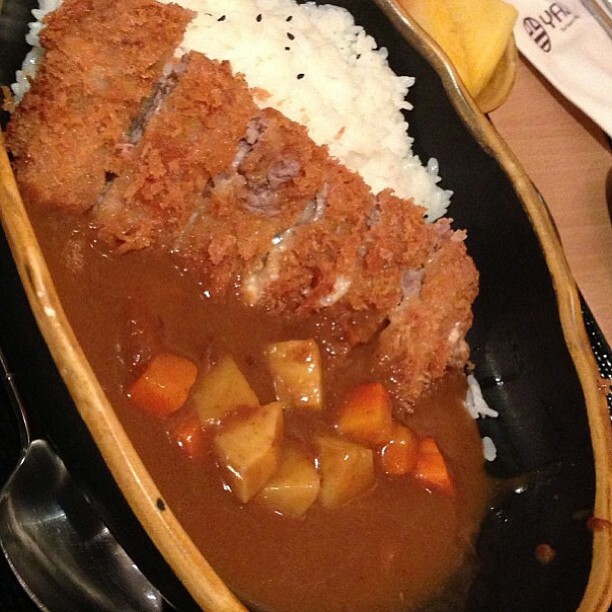 The Menchi in medium hot Yabu curry was also great. Their curry is sweet and thick than the other curries I have had before. It just had the right amount of kick and I was told that they cooked their curries like 48 hours all together if I am not mistaken to ensure that all the spices and everything nice have simmered nicely together and incorporated all their complex flavors into one full bodied and flavorful curry to go with their delish katsus. You can choose to go really spicy, medium or light on their curries. Totally up to you! I have to give it to you Yabu, always a pleasure to dine with you and thanks again to Erika for being our gracious host. Now I am on a mission to check out their Katsudons and see how they fare in my book of tasty treats. On a side note, Yabu's miso soup and rice are now unlimited like with their cabbage and you can also opt for some organic rice too! 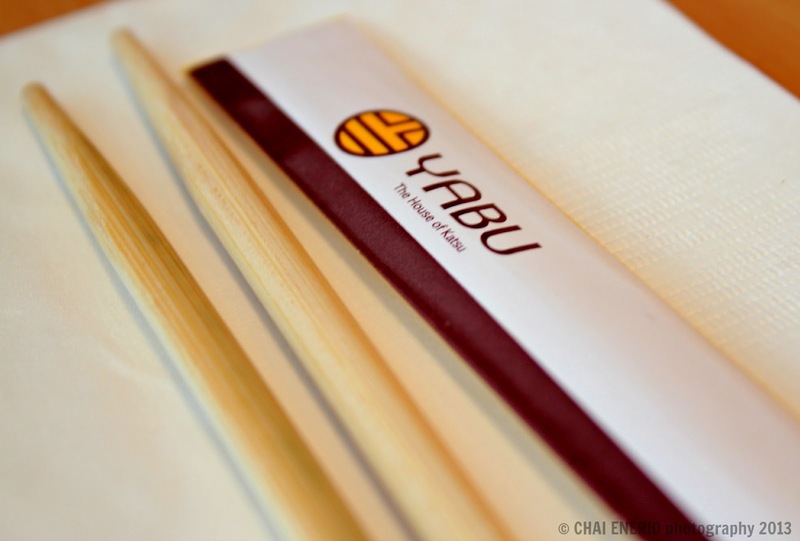 I can't wait for my next Yabu meal.